Franz Lino/Photo Editor Members of Students for Justice in Palestine (SJP) protest Israeli actions in Gaza by reading the names of Palestinian children who have been killed in the conflict. The protest took place along the Spine on Tuesday and engendered a counter-protest from a coalition of Jewish student groups. As Binghamton University’s newest batch of Bearcats made their way along the Spine to their first college classes on Tuesday morning, they came across a sight that has become common on BU’s campus in recent months: demonstrations from the Students for Justice in Palestine (SJP) and numerous Jewish student organizations. 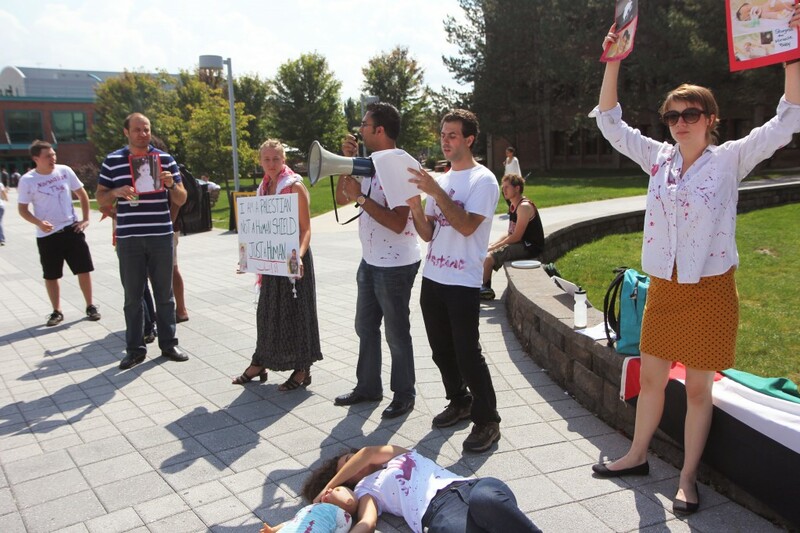 Using a megaphone and wearing shirts splattered with fake blood, members of SJP read the names of children who were killed in the conflict in Gaza. Some ralliers, however, said that the discomfort could end up having positive effects. Jonathan Lohnes, a member of SJP and a Ph.D. candidate in Middle Eastern history, said that whether or not a person felt overwhelmed by the demonstration was a matter of personal preference. Jorge Alpuente, a senior majoring in accounting, said that he thought the counter-demonstrations were great. He added that the only thing he would change was the fact that the opposing sides were facing each other. Carla Sinclair, Joseph Hawthorne and Alexandra Mackof contributed reporting to this story.